Welcome (back) to Austria, ACT students! 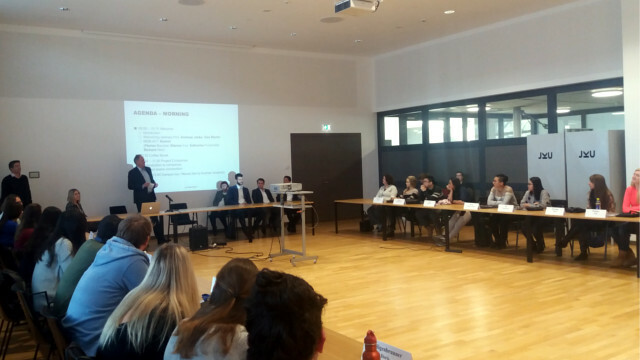 Johannes Kepler University (JKU) Linz officially welcomed the ACT students, comprising Austrian, Canadian, Taiwanese and other nationalities, such as Indian or French, on Monday, February 5th. The event was kick-started with a welcoming speech by the vice-rector Univ.-Prof. Dr. Andreas Janko. Alumni of the Global Business ACT program also joined this event and the students had space to network at the succeeding brunch buffet. The welcoming ceremony was rounded up by the presentation of the company projects and the respective highly prestigious firms based in Upper Austria, such as Fischer Sports, KPMG, Rosenbauer, etc. Again a warm welcome to JKU Linz.